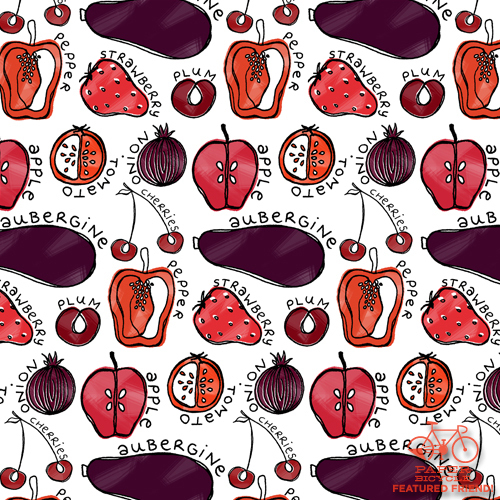 Awesome Entries & Winner of the JANUARY PATTERN CONTEST! It's that time again! 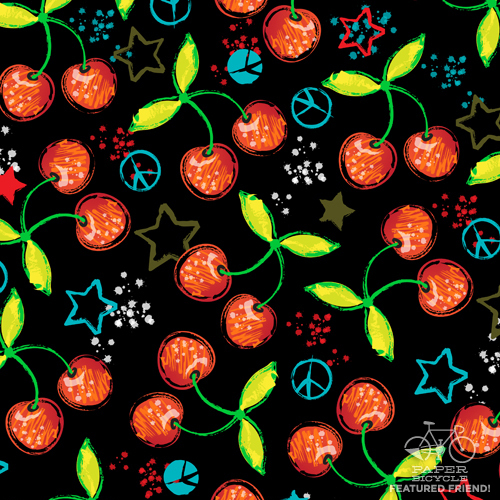 Time to showcase the entries, and lucky winner, for the first Pattern Contest of the new year! 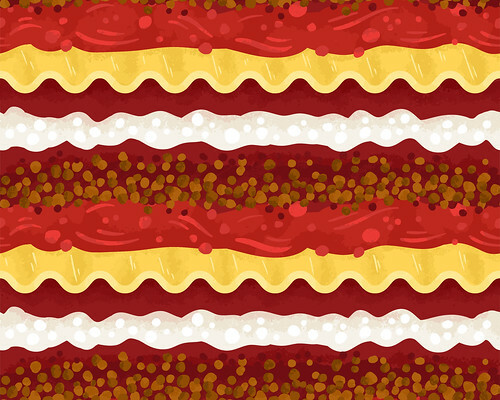 Special thanks to everyone who participated for taking the time to make these excellent patterns! It's always hard to choose a winner and this month was no different! This month's topic was Food, and it's pretty obvious the majority of people are split into two camps; sweets and veggies! That's cool, I'll take 'em both! Without further ado, let's announce the winner! 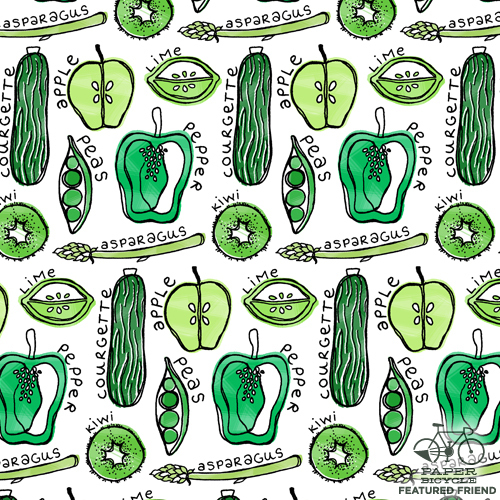 Congratulations to Rebecca Greenwood for making these three awesome patterns! They're all super cute and deserving of praise, but my personal favorite is the orange themed one! So let's call that the winner! 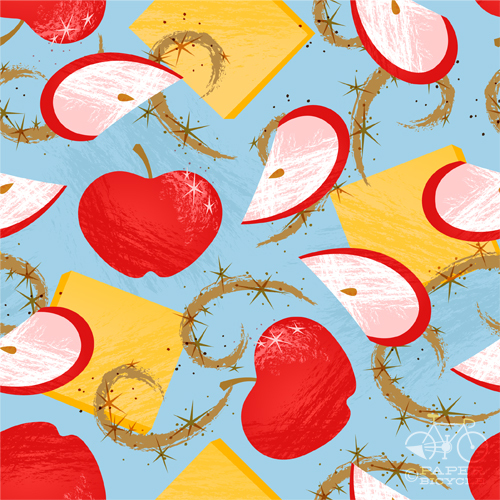 See more of Rebecca's excellent work on her site and give her a big round of virtual applause! 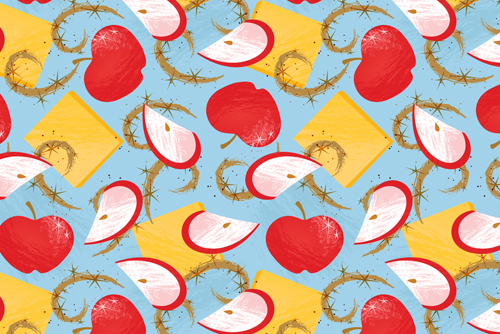 But of course it was a hard decision because we had a lot of great patterns submitted this month! So let's check them out! 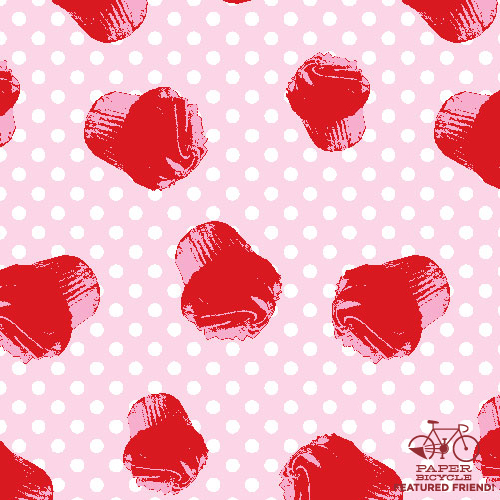 Heather Tubwon knows the secret to our hearts at Paper Bicycle; Cupcakes! Looks tasty, although I wonder what some of those cupcake flavors are! 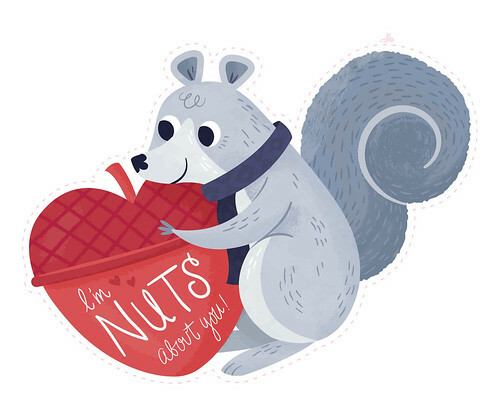 See more of Heather's work at her site! Cupcakes were a popular food in this contesnt, and Anne M Bray bring makes an excellent contibution with this super cute pink number! 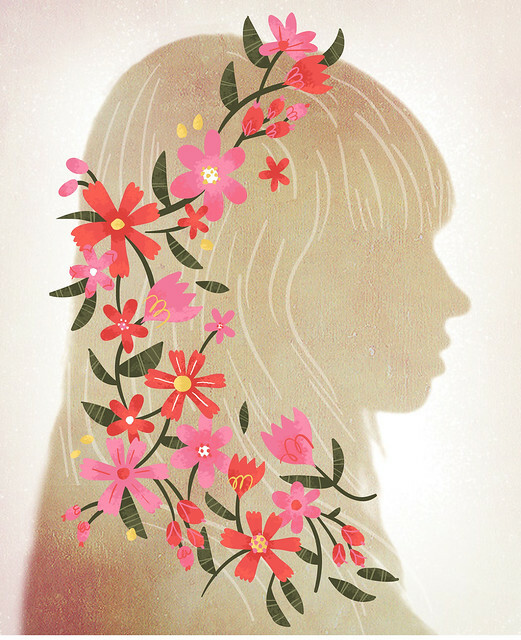 See more wonderful work at her blog! 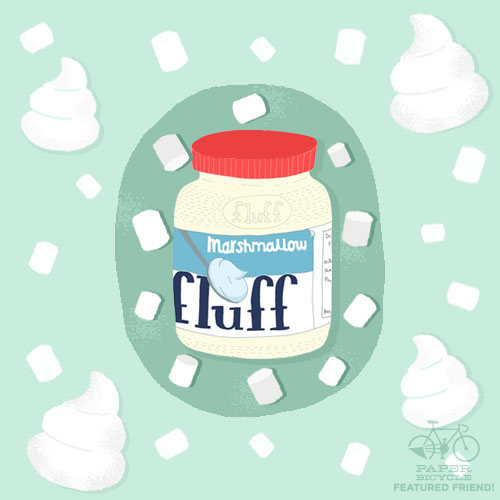 Previously featured Anna Rodighiero has a very sweet tooth, because pure marshmallow in fluff-form is about as sweet at it gets! The color on this one is just icing on the cake! You can find out more on Anna's website and blog! 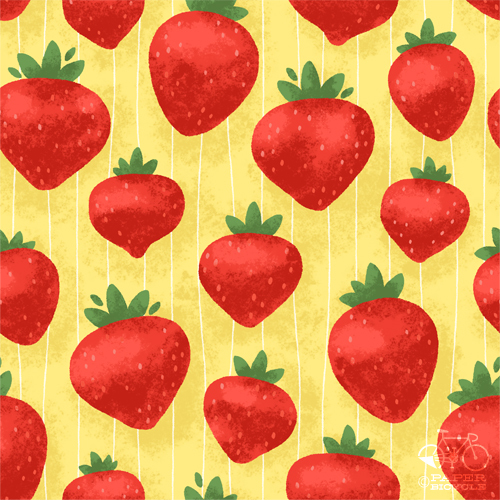 Previous Featured Guest Emily Muschinske sent in not one but two super cute, fruit themed-patterns! You can see her work at her website and follow her on twitter @emilymuschinske. Also (and this is super exciting) she's now offering art courses! 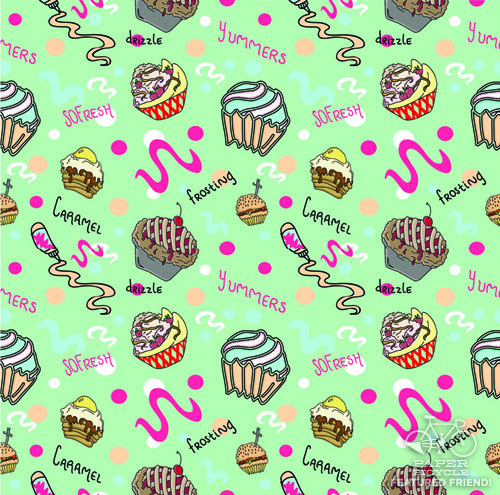 Abbey Freundschuh brings more of the cupcake love with this dessert-inspired pattern, but she doesn't discriminate! All desserts are welcome! 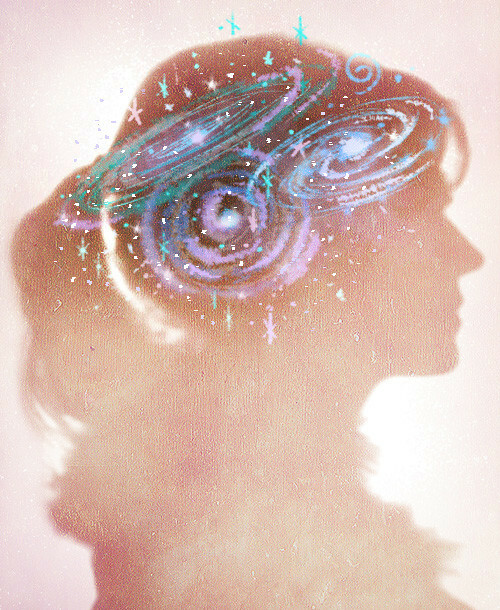 Check out tons of great work on Abbey's website! 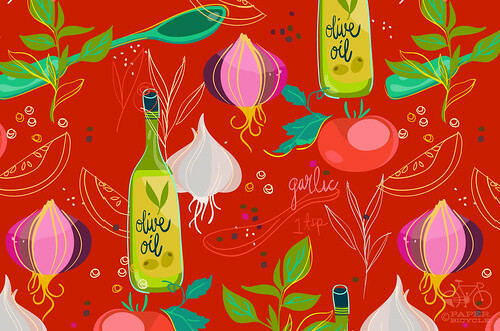 Alexander Bielovich titled his pattern "Mystery Ingredients" so I'm not so sure I'd want to eat whatever it is. But I sure like it anyway! Super colors! Check out Alexander's portfolio! Good to see some people are thinking healthy! 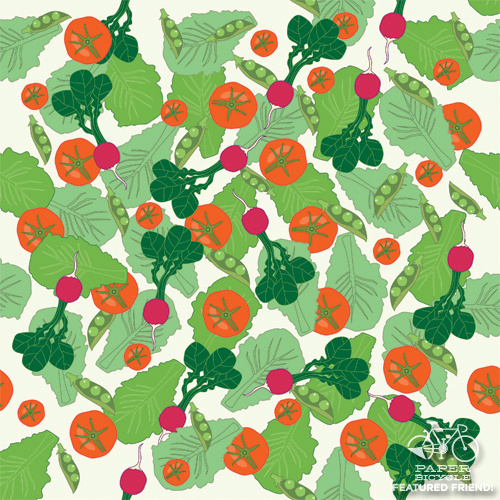 Emily Harris represents the power of the veggie with her gardentime pattern! See more on her site and get inspired on her blog! Whoa! 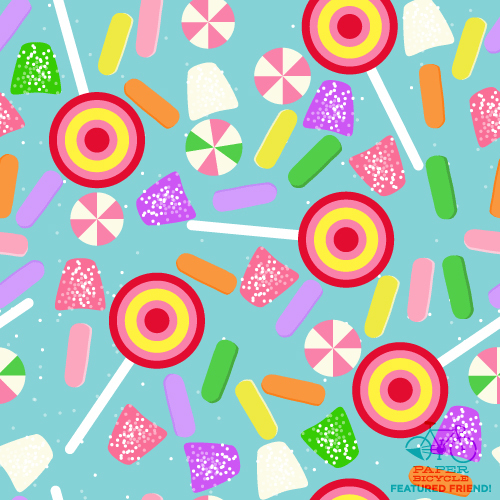 It's a childhood dream in this this bright, super-fun, sugary-rush of a pattern by Tammie Bennett! 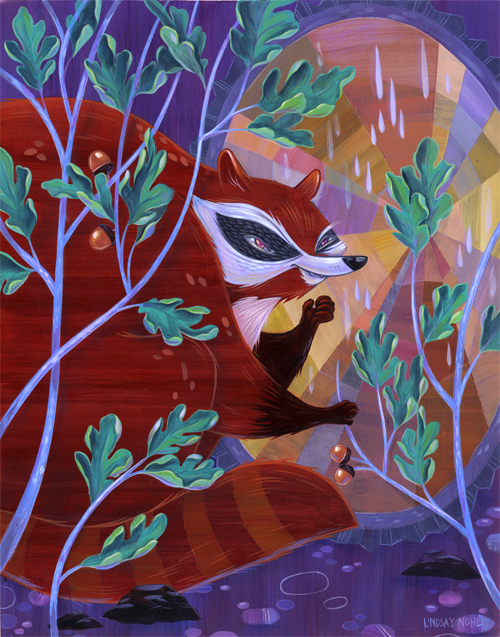 See a lot more work on her site and follow her on twitter @tammiebennett! 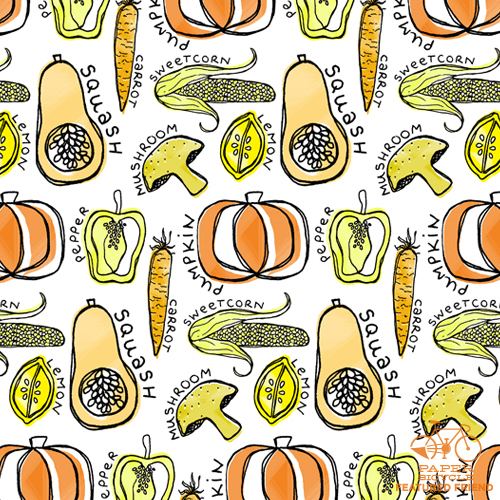 Melanie Schultz sent two awesome patterns this month and proves a person can appreciate all types of food. 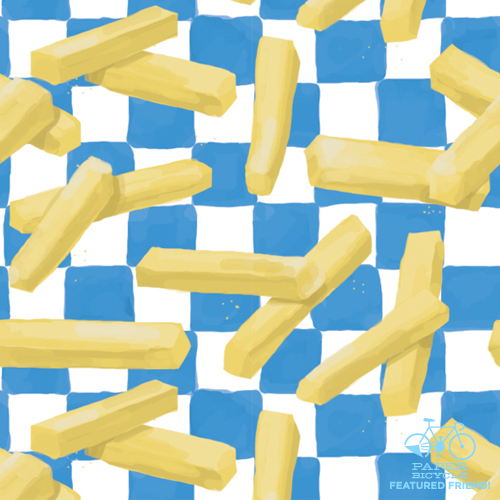 From light, fresh and delicious sushi to comforting, greasy fries. Be sure to check out Melanie's site and her ambitious blog! Thanks again to everyone that entered! We're proud to show off your work! And be on the lookout for the announcement of our next contest shortly! Ah yes. I can't believe it's already Thursday. How the heck did this week pass us so fast? It seems like just yesterday it was the beginning of January, doesn't it? Time flies when you're having fun. "You get more done when you're busy." You like that quote? Me too. If you really think about it, it's totally true. When you've got a to-do list a mile long, there isn't time for dawdling. There's only time for doing. Time for getting things done and doing them fast. Anyone out there feel like they're running at breakneck speed, too? What do you do to relax? What's your favorite way to gain back a little you time? Traveling? Reading? Watching TV? This is what I'll call a stream of consciousness pattern. Not sure where it came from or what is going on. This is one of the many ways I get in a little relaxing time. Figures, doesn't it? 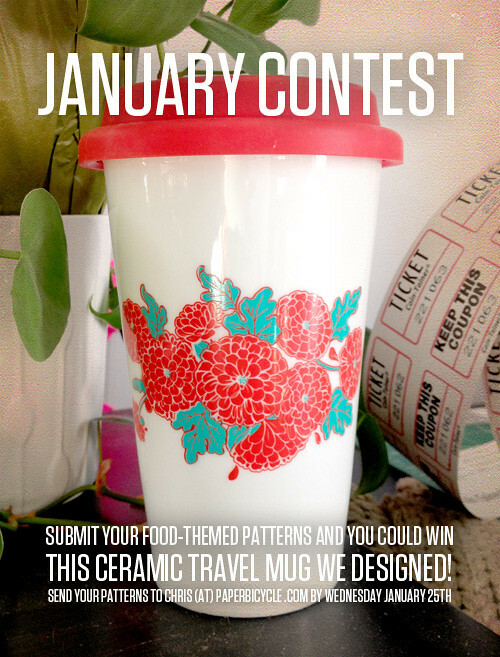 If you're still interested in submitting a pattern for our January contest, please do! We have a little less than a week to get all of our submissions in! 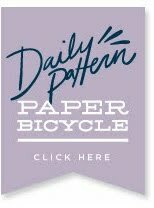 Remember, all you have to do is send a pattern over to Chris (at) paperbicycle (dot) com, along with your contact info (blog, site & name!)! We'll post you on the site and put you in the running to win our prize! So far, you've got a great chance of winning! We've only received a small number of submissions this month, so if you're interested, now's a great time to join us! 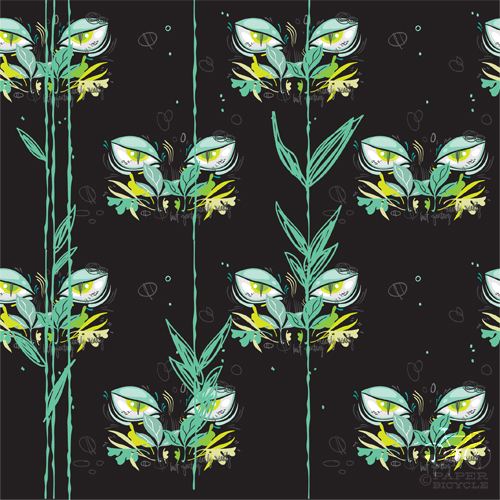 Good luck and happy pattern-making!! IlloMN Gallery Show, Painting a little & an Update! Wow, it's been a crazy week here at PB. I can't even describe to you the horrors, and the craziness, the laughter and the tears. Well --- I GUESS I can... Pretty much we've been scrambling trying to work hard getting ready for a slew of things. We got slammed this week by a ton of awesome new projects at work. 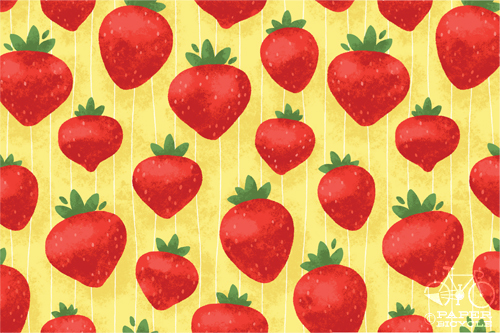 Some Print & Pattern, some packaging, some product development, 2 books, and some greeting card revisions, some sketches for toddler clothing... the list goes on and on. Besides that, Francesca and I have been gearing up for a show we're in called IlloMinn 3. There are a ton of super talented people that are going to be in it, including one of my favorite MN artists, our good friend Andres Guzman. Today was the drop off date for work, so the last couple of nights have been spent finishing paintings, drawing on Moleskines that are going to be auctioned off, and basically just tying up loose ends with Light Grey Art Lab (our new project). 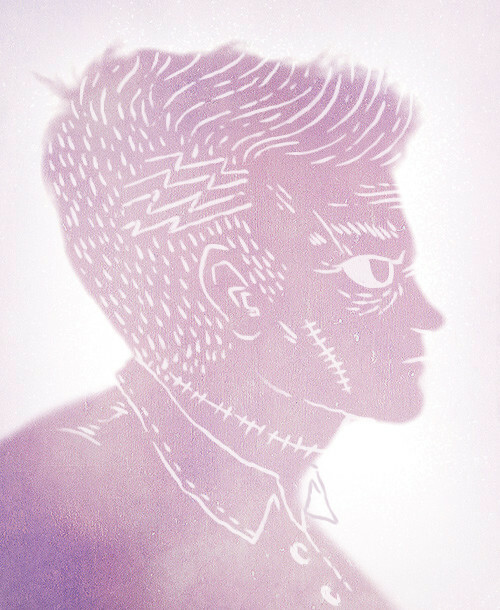 A detail of his sinister face! And to top it off, I decided to undertake one MORE project, finishing up a painting I started for my awesome friend Llew. 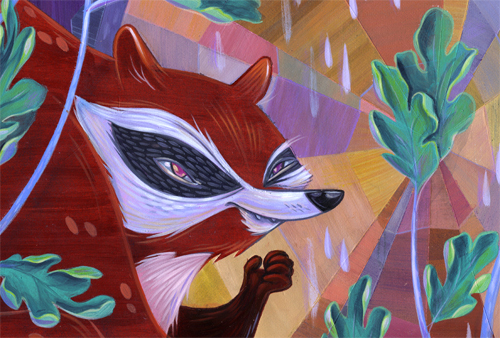 I told him a while back that all I used to paint while I was in college were raccoons eating garbage. So here's an homage to the days of olde. Super excited to get that up there! 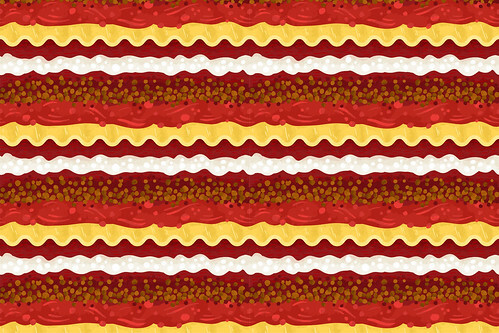 So, no, it's not a pattern, but you can see a little pattern influence in it for sure! I've always been a fan of peanut butter cookies. 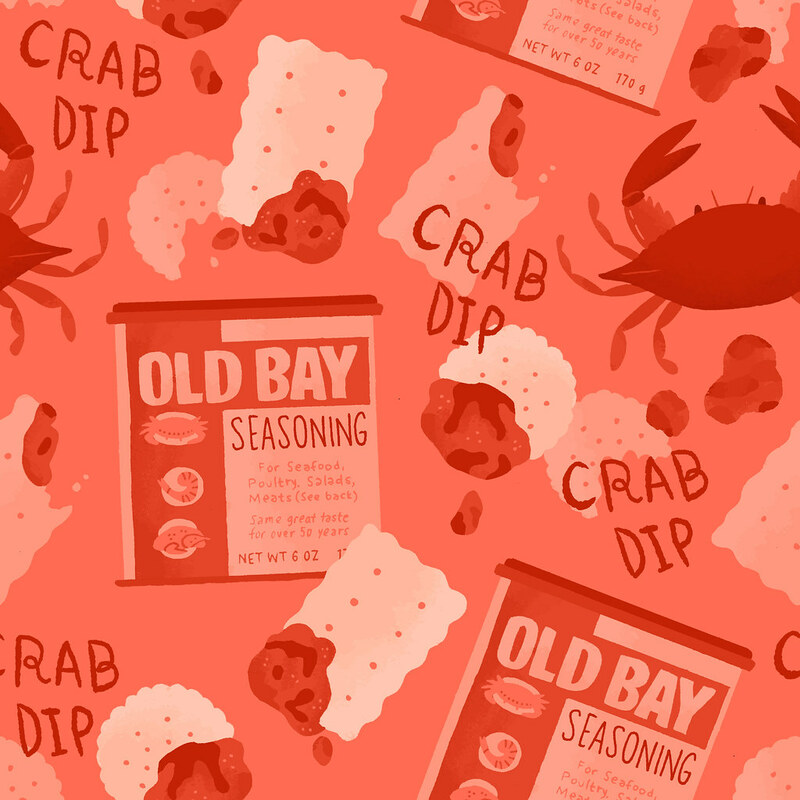 Oatmeal Raisin is pretty boss, too. Chocolate Chip has it's place but it comes in a distant third, I guess. Argue all you want, you won't change my mind. BUT! Maybe we can come to a compromise? Eh? Why not combine them all into one crazy cookie? 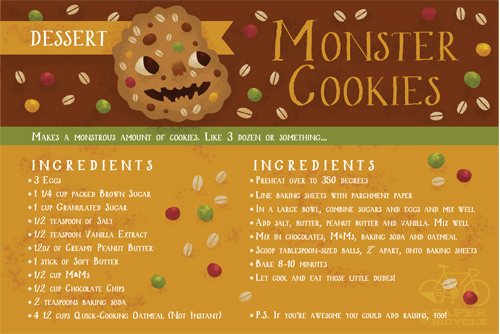 A monster cookie, as it were? YES! I know that back in elementary school (Kegonsa represent!) 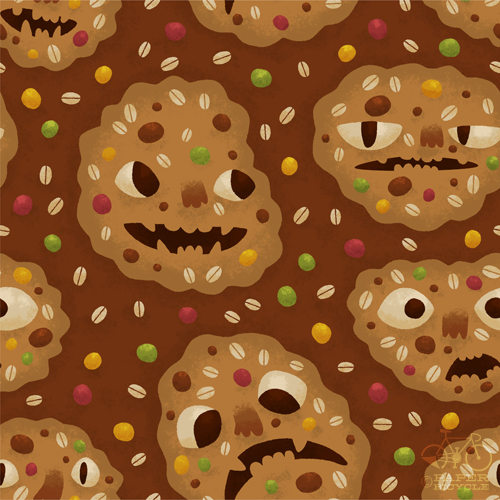 when it was cookie time, I was always rooting for Monster Cookies! And not even because I liked them better than any other cookie. It was because I was hoping and praying with all my might that this time, THIS TIME, they'd look like real monsters. 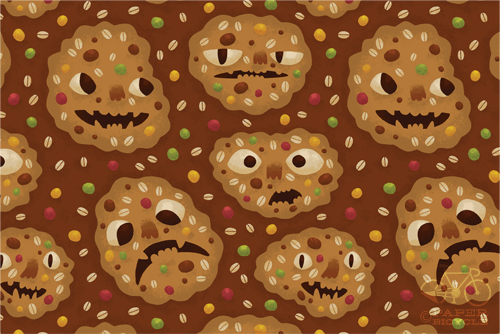 Alas, they never looked like anything more than lumpy M&M cookies. 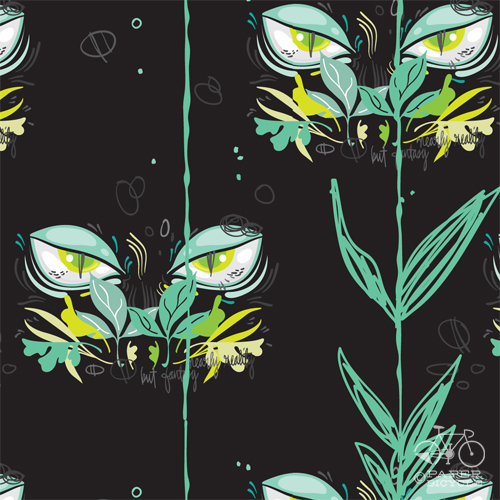 Which is why fate forced my hand to make this pattern today. 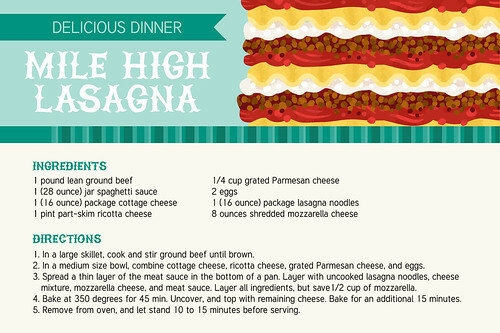 There's nothing more delicious than an Italian dinner, and lasagna is king of foods! It's an easy recipe that produces a ton of food, and a lot of left overs (depending on how many people you decide to share it with). It's been a long time coming! 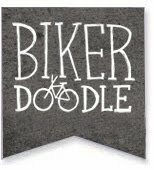 I wanted to make an official announcement here on the Paper Bicycle Blog! We have been preoccupied for the last 6 months or so while we planned, schemed, organized, and prepared for this! The short explanation is : it's a community center for art & design! We'll be holding a variety of workshops, gallery openings, events and travel workshops for the creative community! Have you ever wanted to share your skills? Have a show? Collaborate with other creative types? Well, come on over. Paper Bicycle and Light Grey Art Lab will share our new space at 118 E 26th Street #101 in Minneapolis! 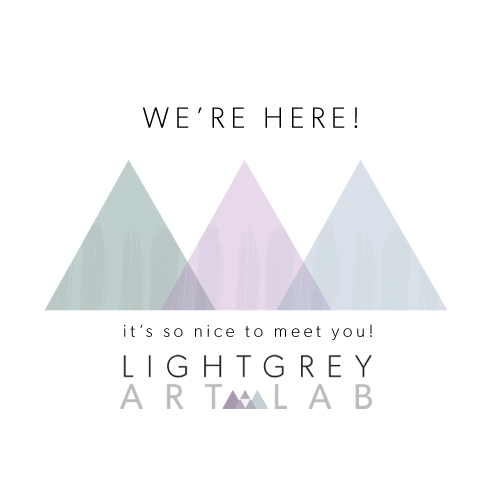 We'll be posting all of our progress on the Light Grey Art Lab blog. Over the next couple months we'll be organizing a series of shows and looking for new instructors for the Summer months! Hit us up! Well, that's about it! We'll keep you posted! Thanks for being there for us!! 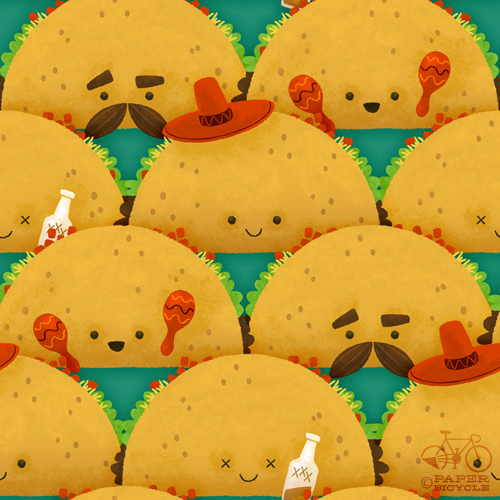 Taco's are a crowd pleaser, who doesn't love a mother freakin' taco?! Jerks, I guess, maybe. Only a jerk would dare to not like tacos. I came up with this recipe when trying to use up the massive amounts of vegetables we got from our CSA this summer. I use seitan for the protein but if you're not vegetarian feel free to use anything your heart desires in it's place! Although I totally recommend the seitan either way, it's probably my favorite protein out there. Specifically Upton's Naturals. 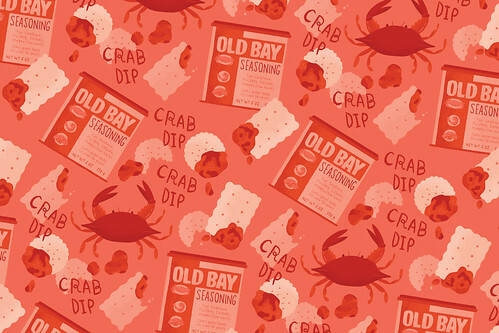 It's the best and the packaging is pretty awesome too! Anyway, throw this mix on a tortilla with all the regular taco fixin's you want and I guarantee it'll be a party in your mouth! 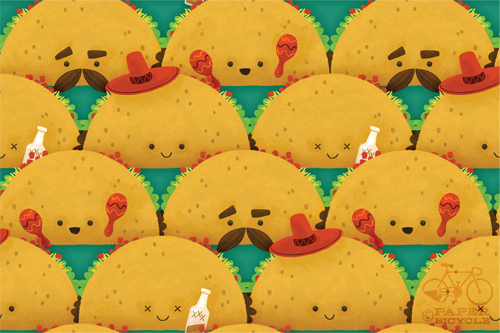 A cute taco party! When I was in second grade, we made a cookbook full of recipes of things that we (as second-graders) could easily make with a little help from our parents. Happle Bagel Sandwiches are a concoction I still turn to in a pinch for a quick and delicious lunch. 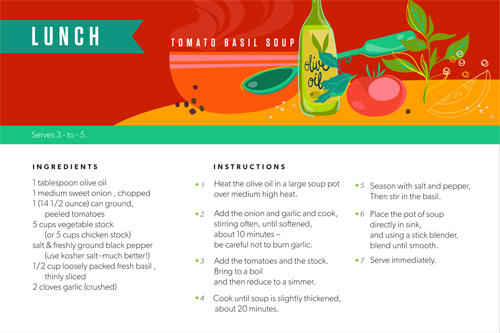 Click here for a full sized downloadable recipe card! Hey! We're back with our official contests! Here you go! The official post with an awesome prize! So! Here you go! 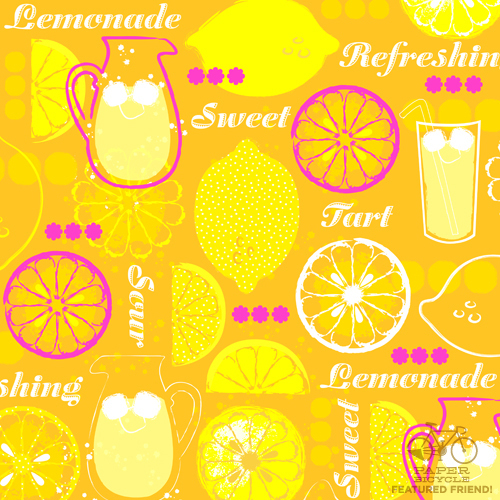 Francesca and I actually collaborated on this travel mug design! It was a team effort! And... it could be yours! 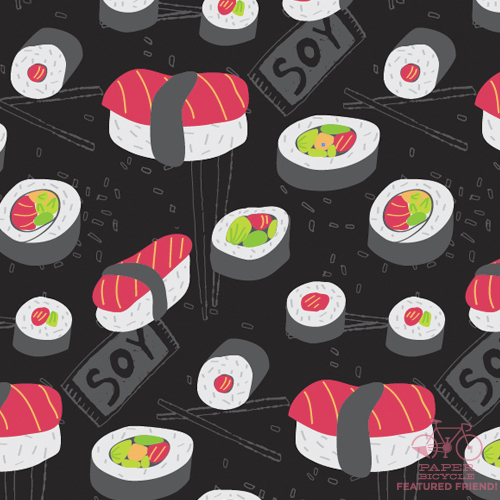 We're looking for food themed patterns to post! 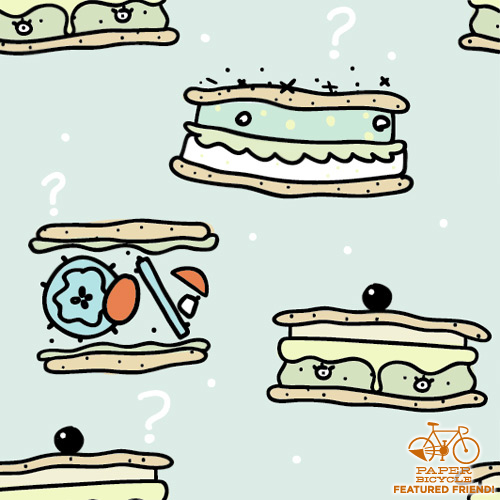 Send your best (and tastiest) patterns our way to chris (at ) paperbicycle (dot) com by Wednesday January 25th and you'll be in the running to get our prize! 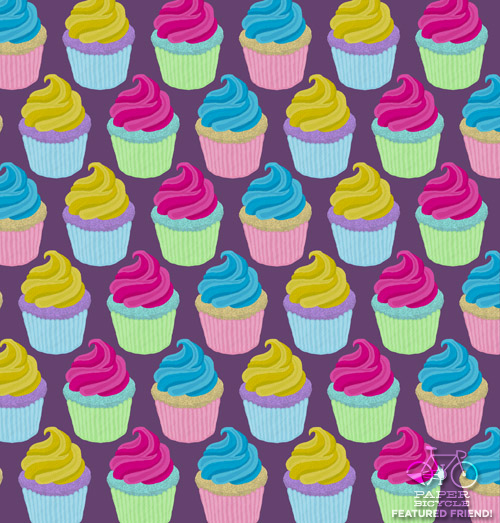 Anything and everything edible counts! 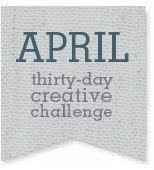 Be creative, or be silly, or be serious! Anything goes! 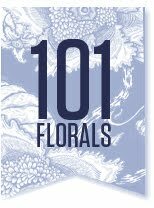 Just send us your pattern at 500 pixels wide, along with your contact information on how we can get ahold of you -- plus any links to your website, blog, etc and we'll post you! All entries will be posted at the end of the month and we'll announce our winner that Friday! Foe's beware! 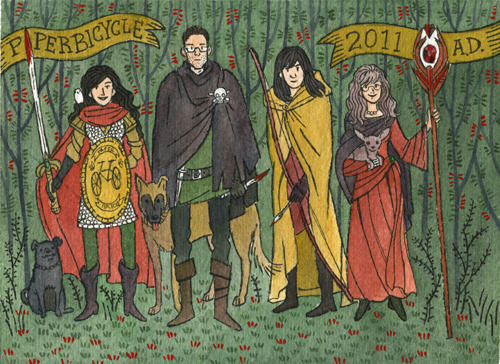 For an awesome Christmas present, Francesca painted a fantasy Role Playing Game version of everyone at Paper Bicycle! We're a pretty nerdy bunch and picking which fantasy combat class best suits our personality has always been a fun topic of conversation. Francesca finally took it a step further and created the official Paper Bicycle Guild portrait! Here's a breakdown of everyone's class. Lindsay the noble Paladin; a mighty leader who is fierce in combat with her sword and shield but also able to support her compatriots with heals and buffs when needed. Chris the shadowy Rogue; always lingering in the background waiting to strike with cold, calculated efficiency, Chris' twin blades should always be feared. Francesca the quiet Hunter; keeping her distance and trained with a quick and accurate bow, her arrows always find their mark. Francesca is also one with nature and friend to her animal brethren. Alyssa the cunning Mage; conjuring with the power of words and spirit, Alyssa makes up for what she lacks in brawn with charm and magic. Also present: Noble Peeps the jolly Bard (he's on Lindsay's shoulder), Sir Twinkus the fearsome Orc, Lord Atari the Noble Duke, and Spry Sully the tiny Spite. Thanks for the awesome present, Francesca! We couldn't have asked for a cooler gift! We took a quick break to take a couple photos. I was sitting here in the corner of the room being blinded by the sunlight that was streaming in the window. 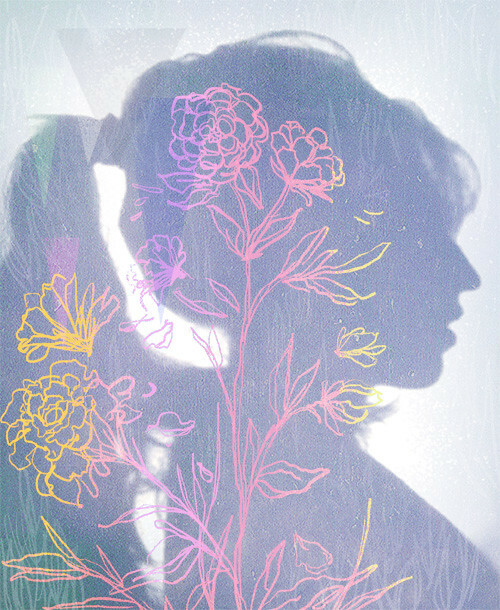 I noticed out of the corner of my eye -- from where I sat, my silhouette hit the wall and it looked crisp and perfect! So, here you go! A quick wall-silhouette photo of each one of us! Yeah, we're a little distorted because of the angles, but that'll add a little character! Hope everyone is having an amazing day!! Some people might crave candy, ice cream or bacon but I crave salads. Some days all I can think about is biting into a crisp, fresh salad and it drives me nuts if I can't find one. The key is that it's got to be an amazing one, which is trickier to find that you might think. 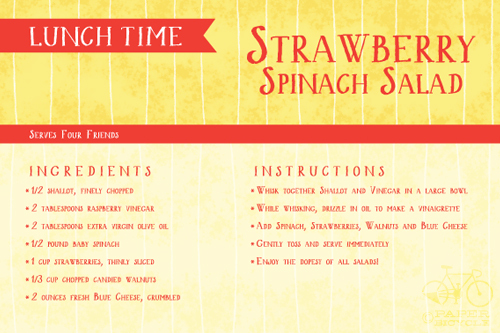 That's why I have a few go-to salad recipes for a pinch and this Strawberry Spinach Salad is one of my absolute favorites. I don't know about you, but I am getting colder by the minute. 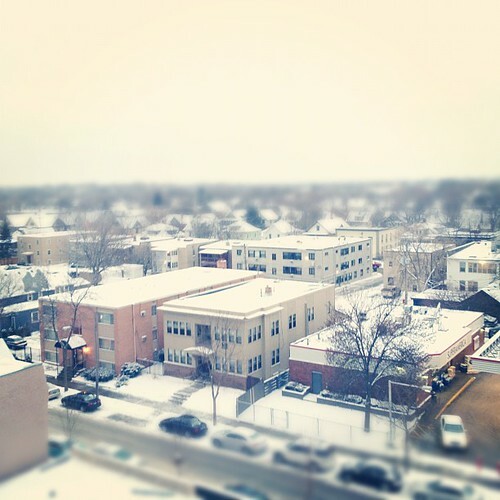 Winter is harsh over here, and today I splurged for two pairs of long johns and a new coat. Maybe I need a little more meat on my bones? Or maybe I just need to warm up with a good cup of soup when I have the chance. Today's recipe is one of my very favorite soups. 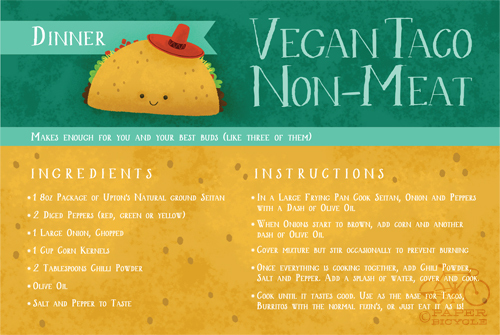 I've chosen to illustrate this recipe, which can be made in both a regular and a vegetarian option. 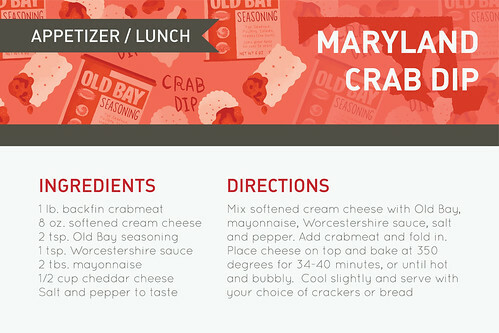 I also happen to think this would be great paired with a quick and dirty grilled cheese sandwich, if you needed a bit of lunchtime variety! 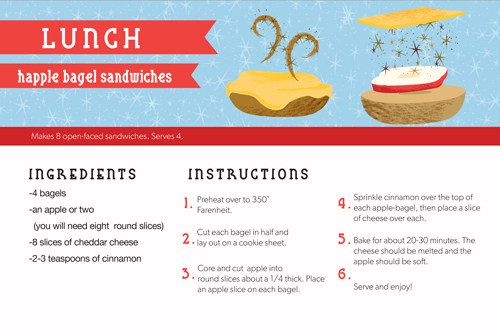 Don't forget -- we put the low res versions on the blog, but if you click HERE, you can download the high res version of this recipe card -- which can be printed on a sheet of 8.5 x 11 letter sized paper. 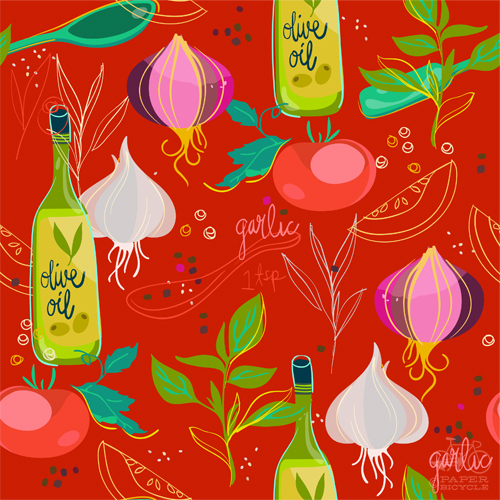 I'm in a soup-y mood this week, so I think I'll be enjoying a bowl of this myself!